Pontos Requerido: 50 Tenha em atenção que este artigo não está disponível no seu dispositivo. Pode adicionar o artigo na sua Listas de Desejos e realizar a solicitação a partir de um dispositivo compatível. 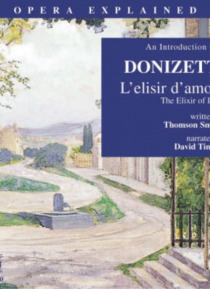 L'elisir d'amore, or The Elixir of Love, has remained popular for almost two centuries because of a touching tale and a galaxy of comic characters adapted from the traditional commedia dell' arte. Above all Donizetti poured into the score all the warmth and tenderness of the Italian temperament. His melodic invention never ceases to charm whether in the jolly rustic choruses, the exhilarating 'pat… ter' numbers, or the sweet sadness of the beautiful arias, of which 'Una furtiva lagrima', the great tenor showpiece, is the best known.